Imagine all of your club's important documents in one central place where the current Committee could always access them in years to come. The problem of crashing hard drives and lost USB sticks will be a relic of the past. The Majestri Document Vault is the place to upload the files that matter (especially a Liquor License if you are lucky enough to have one). It's not all about safe-keeping though. It's also possible to link to documents from any page on your web site, plus in outgoing emails. It's an extremely simple process and you probably won't even need to read this, but there are a couple of little areas that could do with explanation. The Document Vault is worthy of its own tab in the Control Room. We're not even going to do a screen print as you honestly can't miss it. The Document Vault is best used for documents that are finalised. If you're looking to have active documents that you want a whole heap of people editing, then the Document Vault is not the best tool for that. We recommend Google Docs for that kind of document collaboration. If anything, you could upload the finished product of that collaboration to the Document Vault. To facilitate the uploading of files to your web site, we rely on a technology called Flash. Apple products (iPad, iPhone, MacBook anything) do not support Flash, so you will not be able to use any of those devices to upload any files to your site. It's a bit of a limitation, we know, and we hope one day to rectify this and build our own uploading infrastructure. Not much to say here. 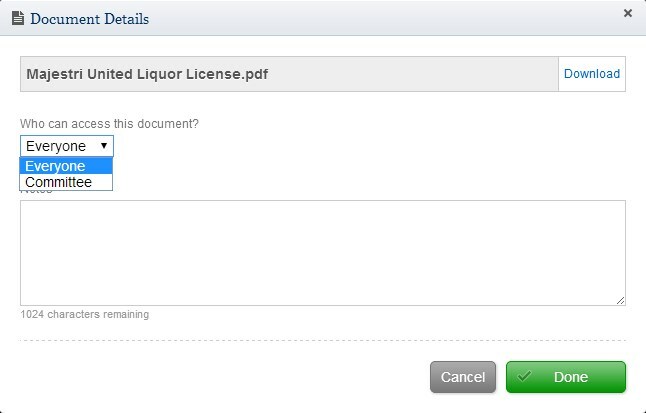 Once clicked, the button that says Upload a File will ask you select a file from the machine you're on. When you've chosen one, it will be transferred to your site and appear in the list. The important field here is the drop-down list that lets you specify who can access the document? If you specify Everyone, it can be shared without restriction. You can freely link to it in emails or web pages. If you choose Committee, then anyone trying to access it will be asked to log into the system. If they are not on the Committee, they will receive an error message.